Located on the north side of County Road 36, between County Roads 33 & 35. This was started on land which was originally owned by Samuel Thomas. The cemetery had its name changed from Union Chapel to Clinton Union. At one time there was a small Chapel building located on the east side of the cemetery, where all Denominations would use it for their services. This building has long since been moved from the cemetery. 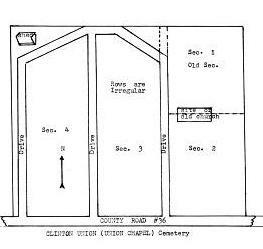 This cemetery was copied, August 4, 1979, by Elkhart County Genealogy Society, but two sections were lost and so Section 3 & 4, were recopied in August and September 1984. All rows copied, starting at County Road 36 and goes to the north. Each row is numbered from east to west. The oldest grave found is Caroline, daughter of B. F. Scoles. She died May 30, 1840. Next seems to be for an infant son of Jacob and Mary Beckner which was born and died September 1, 1841. In 1979 the storage shed for the caretaker was situated on the east side of Section 2. Since that time it has been moved to the northwest corner of the cemetery. Rechecked Fall of 1984.